The cryosphere, which encompasses all portions of the Earth's surface where water is found in solid form, is one of the most dynamic components of the Earth's climate system. It includes glaciers, ice caps and ice sheets, as well as sea ice, lake/river ice, snow cover, seasonally frozen ground and permafrost; and hence, it is extremely sensitive to rising air temperatures, such as those predicted for the near future. Cryospheric regions act as barometers of global change and help us to study the processes of climate change in different ways. 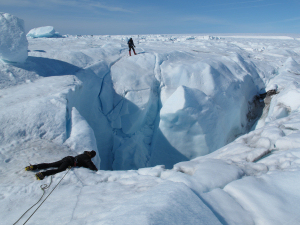 Examples of current research being undertaken includes (i) the formation of meltwater lakes on the Greenland Ice Sheet and their connection to the basal water system; (ii) form and flow of glaciers within Arctic ice caps and the Greenland Ice Sheet; (iii) subglacial processes beneath Antarctic ice streams; (iv) hydrological effects of permafrost thaw in Alaska; and (v) vegetation change in the Eurasian Arctic. 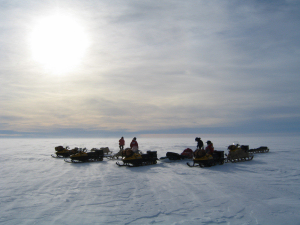 To assess the state of the cryosphere and how it changes with time, we use a combination of fieldwork, satellite remote sensing techniques and computer simulations. We have detected and documented important aspects of the dramatic change taking place in the cryosphere; from the hydrology of former ice sheets to the hydrology of modern ice sheets; and from widespread glacier acceleration in Greenland to the curious stagnation of a large ice stream in Antarctica. Together, these studies have contributed greatly towards our understanding of global climate change. Examples of current research projects can be found in the project index. Work is currently supported by a series of research grants.